"So our titular totem, our tamper-proof taboo, our tranquil memento of mission and dues, our topical target of both cry and hue, the name for our LTS thoughtful and true: I give you, as Seuss would, with hullabaloo, the temperate and thrifty, the talented and tactful but ultimately, and tellingly, trusty tahr." 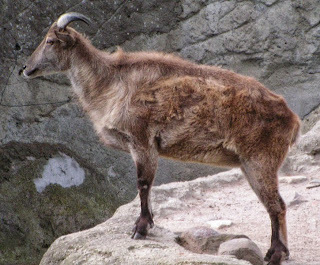 According to Wikipedia, "Tahrs are three species of Asian ungulates related to the wild goat", but Mark refers to only one of them: the Himalayan Tahr, also known as a mountain goat, which he says that "for a long time they symbolised hardiness and fearlessness, perched as they were against the cliffs". As you probably know, the development codename of an Ubuntu release takes the form "Adjective Animal". Initially these weren't in alphabetic order - until Dapper DRAKE (6.06). Up next: Ubuntu 14.10 U U. Will it be "Unhorned Unicorn" :)? Or maybe Unified Urial, because the full convergence should start with Ubuntu 14.10? We'll find out in 6 months! For a list of codenames used in previous Ubuntu versions and upcoming release suggestions, see THIS page.